Dr. Powell published a research report in January’s edition of the Journal of Orthopedics and Sports Physical Therapy which I found very interesting. She sought to determine whether individuals who had previously suffered an Achilles tendon rupture demonstrated altered or asymmetrical biomechanics or loads elsewhere in the body during upper level activity, focusing on a Drop Countermovement Jump (CMJ). Her team’s research revealed that there was in fact a significant clinical difference in ankle power even 4-6 years after the initial injury, as well as clinically significant changes in loading rates and eccentric forces at the involved knee joint. What does this mean to me as a clinician? Well, as re-iterated within Dr. Powell’s report, it is well-established that chronic Achilles ruptures suffer from a permanent elongation of the tendon, which will forever result in active insufficiency of the muscle group as it lacks the ability to generate appropriate levels of tissue stiffness required to transfer and generate high loads. We must understand that regardless of how much or how long we strengthen the plantarflexors, we will be unable to fully re-create preoperative levels of strength in the long-term. By no means am I saying to ignore the involved muscle group, that would be foolish. We still need to strengthen them to their fullest capacity, whatever that new level may be post-operatively. However, I think the biggest takeaway here is that as always, but perhaps even moreso in this situation, we must consider the entire kinetic chain when designing our plans of care. Restoration of excellent proximal hip and core stability / control, coupled with good eccentric strength and co-contraction of the knee joint may help to overcome some of the plantarflexion deficit and help prevent injury to other joints. 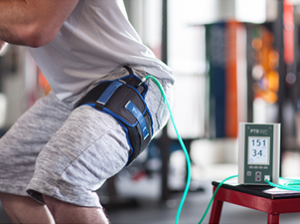 Modalities such as Blood Flow Restriction (BFR) Training can help to modulate thigh strength and atrophy during the early post-operative phases, and SportsMetric jump training can help fine-tune biomechanics in the later stages of rehab and return to play. Our clinicians are trained in both measures, and can properly apply both options to athletes with this inury. Emphasis on a total body approach is pivotal in this situation.